The 2015 Keystone Chapbook Poetry Prize Winner at Seven Kitchens Press. The Keystone Chapbook Prize annually honors a poet with a personal connection to the state of Pennsylvania. 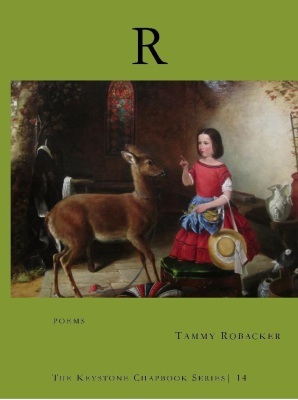 Tammy grew up in Pennsylvania the first 12 years of her life, and this sense of place figures deeply in the poetry of R.
Tammy Robacker’s "R" compresses and illuminates the dissolution of a family in which a harsh American masculinity dominates and/or shadows everything. The poems, skillfully cut and arranged scenes that create a fractured whole, accrue their power by virtue of the speaker’s sustained gaze and voice, which aim to tell the truth and, perhaps unexpectedly, deliver us near forgiveness. My favorite poems in this collection surprise by combining spare and powerful imagery with deft slant rhymes.